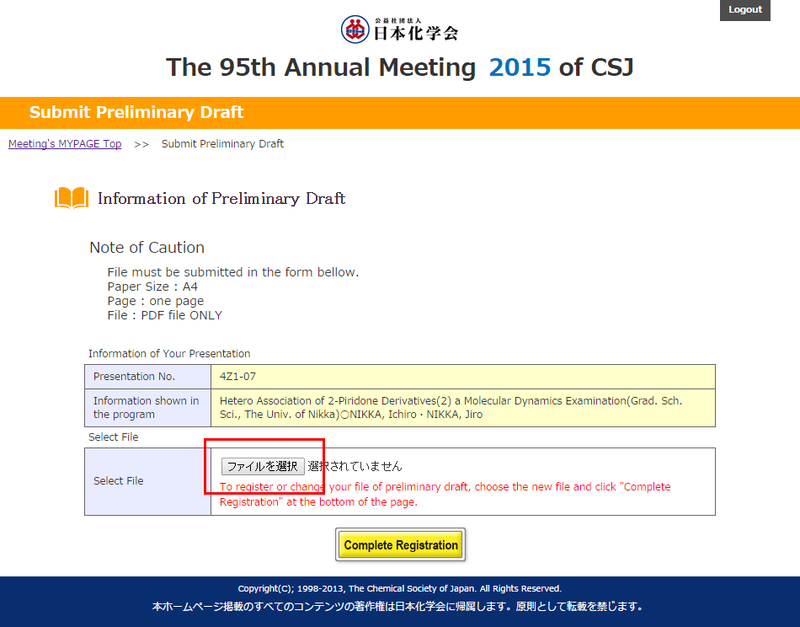 Create your preliminary draft in PDF file and submit by following the procedure below. *If your presentation language is set to English, your preliminary draft must be written in English also. Check "Required Documents List" at "Registration Information" in Meeting's MYPAGE Top. Documents those are not submitted has no check. 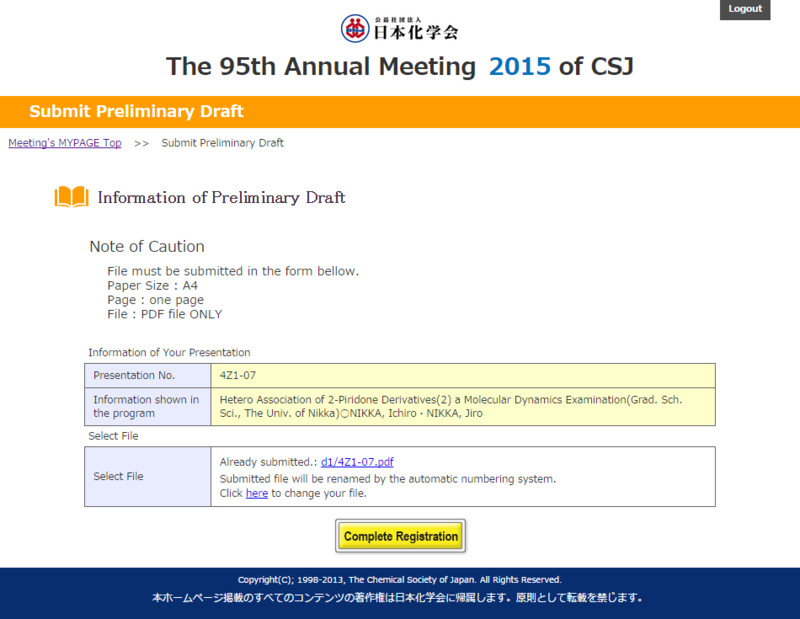 Jump to "Submit Preliminary Draft" by clicking "Preliminary Draft." STEP2. 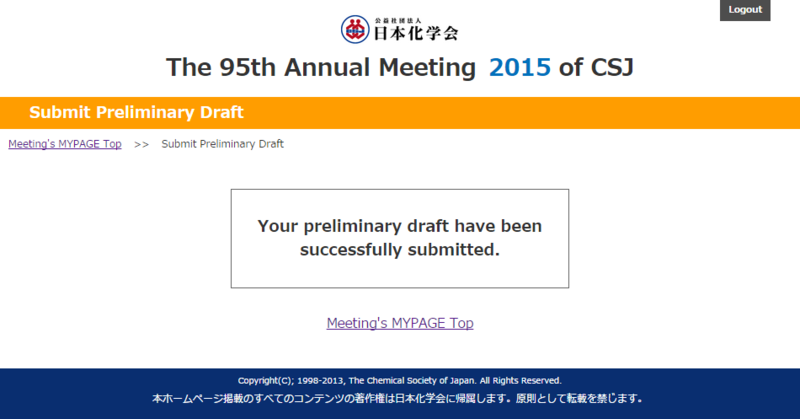 Submit your preliminary draft. You MUST follow the procedure below. Choose the file you want to submit. * Your submission won't complete if you just choose the file. * Submitted file will be renamed by the automatic numbering system. Your preliminary draft have been submitted. 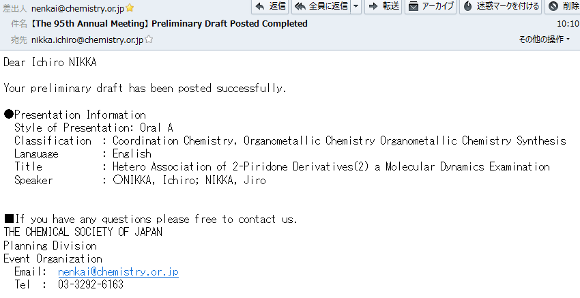 You will receive an e-mail titled "Preliminary Draft Posted Completed." How to confirm and replace your preliminary draft. You can replace your preliminary draft during the period. Follow the procedure below to confirm or replace your file. Check "Required Documents List" at "Registration Information" in Meeting's MYPAGE Top. If the check mark is on, your submission has completed successfully. STEP2. Confirm and replace your preliminary draft. Click "●●.pdf : submitted" to confirm the file you have submitted. Follow the same procedure as you submitted to replace your preliminary draft. Click the link of "Click here to change your file."